Material: 1.0mm Aluminum Frame, 4mm Polycarbonate Panels Product dimensions (L): 1290 x 580 x 1400 mm Package dimensions (LWH): 165 x 11 x 63 cm Weight: 20kg Features Perfect for tiny locations, including balconies, apartments, pat..
Package dimensions (LWH): ctn 1/2 : 192X18X20cm 34KG ctn 2/2 : 145X10X60cm 15KG Details: Plu..
Material: Aluminum Frame, 4mm Poly-sheets Product dimensions (LWH): 1910mm(L) X1900mm(W) X 1950mm(H) Package dimensions (LWH): ctn 1/2 : 138X11X65cm 10kg, ctn 2/2 : 195X18X19cm 23kg Features Single Slide door &nbs.. 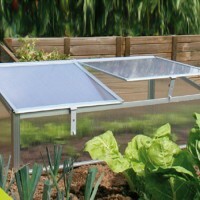 Features: · This greenhouse is incredibly easy to set up with a sliding door entrance so you can get easy access to your green house.. This greenhouse is incredibly easy to set up with a sliding door entrance so you can get easy access to your green house or ad..
Material : 1.0mm Aluminium Frame and 4mm Polycarbonate sheet Product dimensions : 120 x 51 x 51 cm Package dimensions (LWH): 122 x 53 x 6 cm Weight: 4kg Features With this green house one can grow crops all year round no matter the weather. ..
Material : 1.0mm Aluminium Frame and 4mm Polycarbonate sheet Product dimensions : 180 x 51 x 51 cm Package dimensions (LWH): 62 x 53 x 10 cm Weight: 6kg Features With this green house one can grow crops all year round no matter the weather.&..
Material : 1.0mm Aluminium Frame and 4mm Polycarbonate sheet Product dimensions : 60 x 51 x 51 cm Package dimensions (LWH): 62 x 53 x 6 cm Weight: 3.2kg Features With this green house one can grow crops all year round no matter the weather. .. 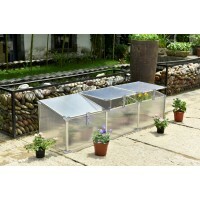 Details: Strong aluminium frame Polycarbonate cover sheet Easy to assemble Easy access top opening Helps to provide UV protection for plants Sizes: Single (LWH): 120 x 60 x 40cm ..
Material: 1.5mm Aluminum Frame, 4mm Poly-sheets Product dimensions (LWH): 3050mm(L) * 1830mm(W) * 2280mm(H) Package dimensions (LWH): ctn 1/2 : 312*18*26cm ctn 2/2 : 145*12*75cm Weight: 68KG Features Single Slide d..
Material: 1.5mm Aluminum Frame, 4mm Poly-sheets Product dimensions (LWH): 1830(L) * 1830mm(W) * 2270mm(H) Package dimensions (LWH): ctn 1/2 : 192*20*22cm ctn 2/2 : 146*11*70cm Weight: 56KG Features Single Slide door..
Material: 1.5mm Aluminum Frame, 4mm Poly-sheets Product dimensions (LWH): 2440mm(L) * 1830mm(W) * 2280mm(H) Package dimensions (LWH): ctn 1/2 : 251*18*22cm ctn 2/2 : 146*11*79cm Weight: 63KG Features Single Slide do..